The robust ewer has a classic 7th-8th century ovoid body which here rises from a flat base surrounded by a slightly flared foot. The vessel is beautifully potted with a full rounded shoulder, broad cylindrical neck terminating in a flared rim and with a short tubular spout opposite a double-strand handle applied with decorative bosses. The glossy amber-yellow glaze falls in thin overlapping sheets over the shoulder to a lemony color toward the flared foot with beveled edge. The compact pinkish earthenware body is revealed on the unglazed base. A precious few kilns are noteworthy for having successfully produced yellow-glazed wares during the Tang period. Of greatest importance among them are the Changsha kilns in Hunan province. 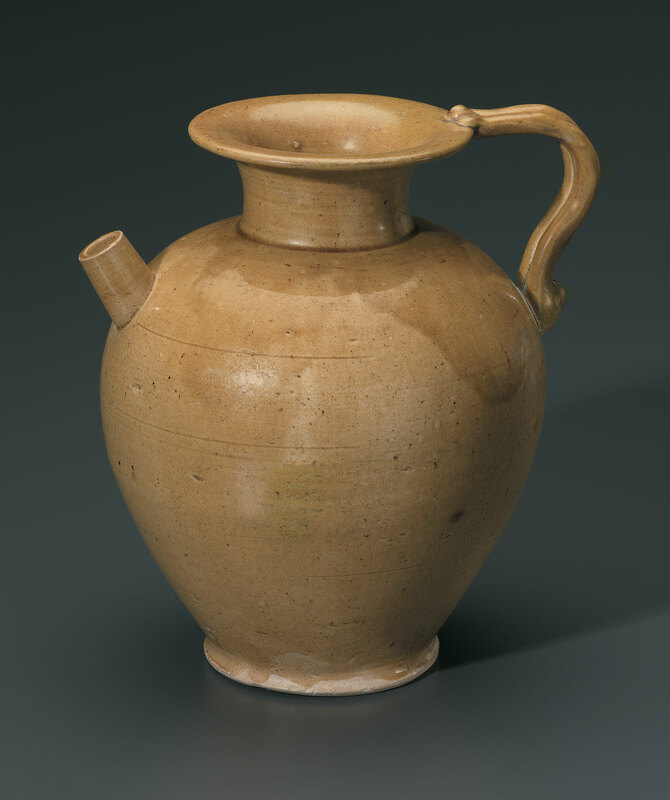 The elegant proportions and more delicate potting of the present ewer suggest production most likely in the north, in either Henan or Hebei, both known for light bodied wares and for amber and more rarely yellow glazes. The rare pale-yellow glaze here relates to Sui-Tang period wares of the Xingtai kilns in Hebei province, where the glazes were used on relatively high-fired ceramic bodies. Pale-yellow colored glazes are also found on lower-fired wares produced in Shanxi province. It might also be suggested that the yellow color here, similar to that of a handled cup made in imitation of a gold or gilt-silver cup, appears also to have been inspired by the most precious of metals.